"We'll drag this place into the new century." Palace Films has unveiled a new trailer from Australia for the release of the indie drama The Dancer, also known as La danseuse in French, a period set drama about a rivalry between two dancers. This originally premiered at last year's Cannes Film Festival, and is just getting a release in US theaters this December. Lily-Rose Depp stars as Isadora Duncan, the protégé and rival of dancer Loïe Fuller, played by French actress/musician Soko, the "toast of the Folies Bergères at the turn of the 20th century and an inspiration for Toulouse-Lautrec and the Lumière Brothers." The full cast includes Gaspard Ulliel, Mélanie Thierry, François Damiens, Denis Ménochet, Amanda Plummer, and Louis-Do de Lencquesaing. This seems like a very passionate, intense, dance film to watch. Check it out. Loïe Fuller (Soko) was the toast of the Folies Bergères at the turn of the 20th century and an inspiration for Toulouse-Lautrec and the Lumière Brothers. The film revolves around her complicated relationship with protégé and rival Isadora Duncan (Lily-Rose Depp). 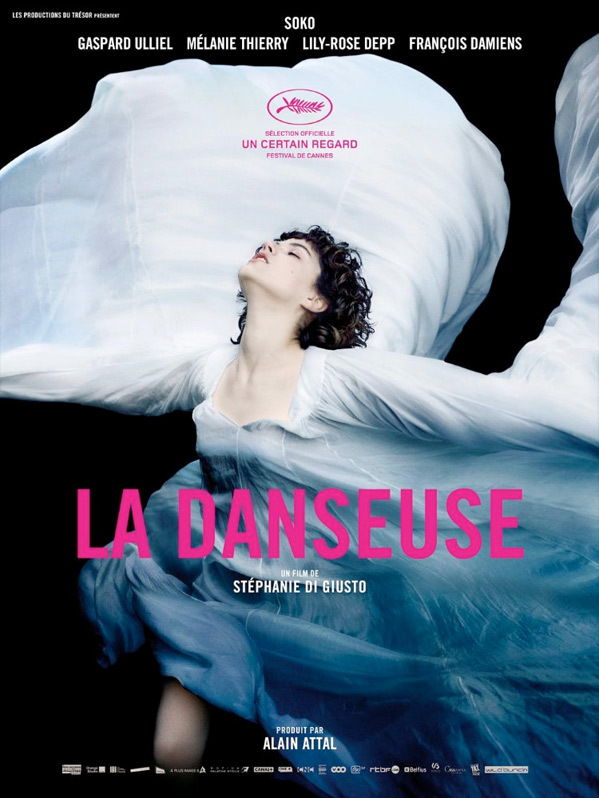 The Dancer, or originally La Danseuse in French, is directed by French newcomer Stéphanie Di Giusto, making her feature directorial debut with this film. The screenplay is written by Sarah Thibau & Stéphanie Di Giusto, in collaboration with Thomas Bidegain; based on Giovanni Lista's novel. This first premiered at the Cannes Film Festival last year, in 2016. Myriad Pictures will finally open The Dancer in select US theaters starting December 1st this fall. Who's curious?